9 — 2 Irwin/Mc. Graw-Hill ©The Mc. 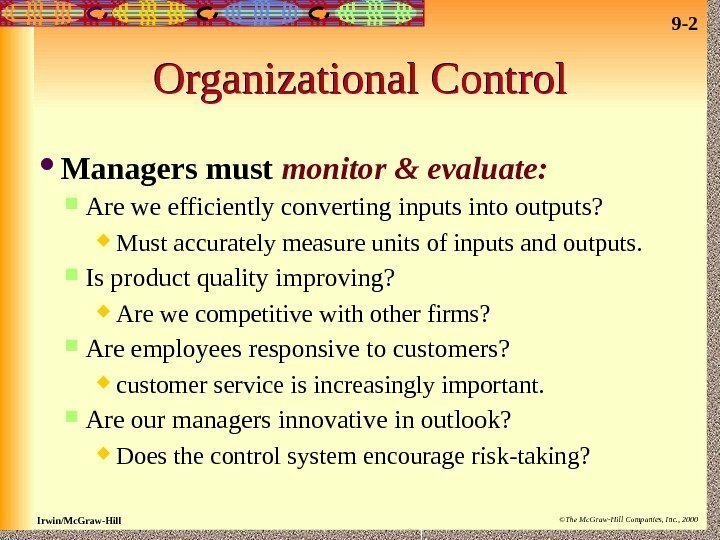 Graw-Hill Companies, Inc. , 2000 Organizational Control Managers must monitor & evaluate: Are we efficiently converting inputs into outputs? Must accurately measure units of inputs and outputs. Is product quality improving? Are we competitive with other firms? Are employees responsive to customers? customer service is increasingly important. Are our managers innovative in outlook? Does the control system encourage risk-taking? 9 — 3 Irwin/Mc. Graw-Hill ©The Mc. 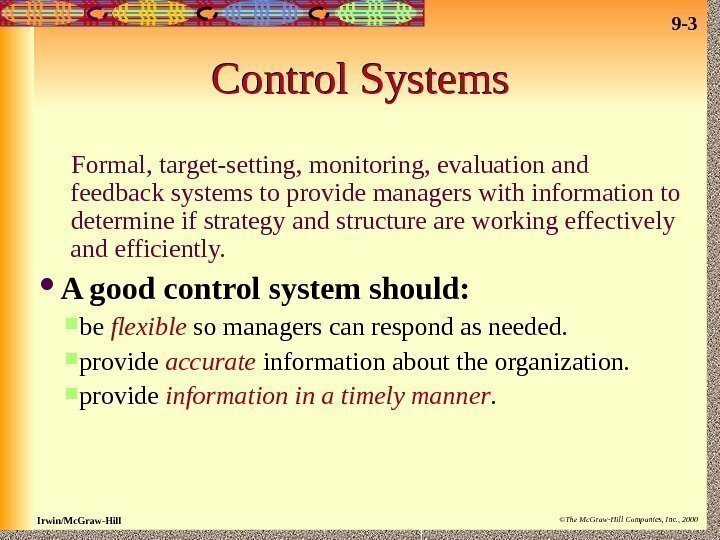 Graw-Hill Companies, Inc. , 2000 Control Systems Formal, target-setting, monitoring, evaluation and feedback systems to provide managers with information to determine if strategy and structure are working effectively and efficiently. A good control system should: be flexible so managers can respond as needed. provide accurate information about the organization. provide information in a timely manner. 9 — 4 Irwin/Mc. Graw-Hill ©The Mc. Graw-Hill Companies, Inc. , 2000 Three Types of Control Inputs Outputs. 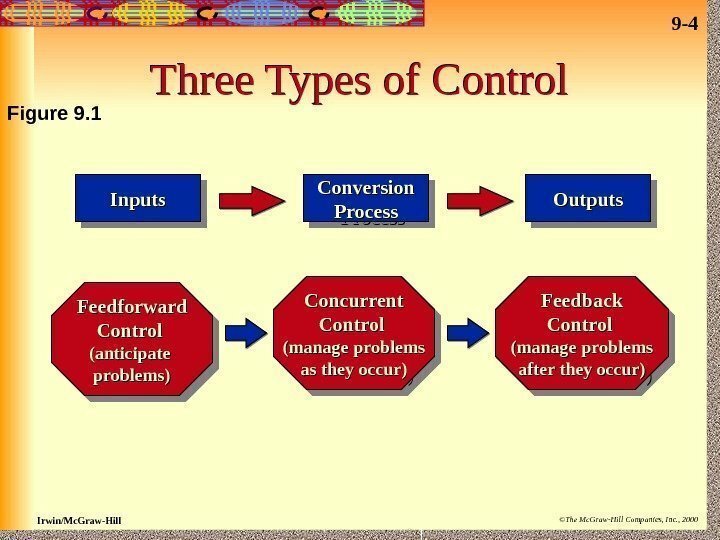 Conversion Process Feedforward Control (anticipate problems)problems) Concurrent Control (manage problems(manage problems as they occur)as they occur) Feedback Control (manage problems(manage problems after they occur)after they occur)Figure 9. 9 — 5 Irwin/Mc. Graw-Hill ©The Mc. 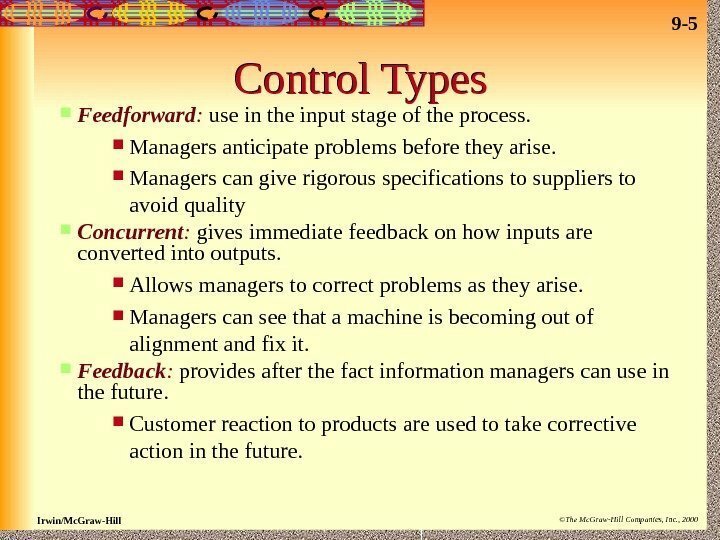 Graw-Hill Companies, Inc. , 2000 Control Types Feedforward : use in the input stage of the process. Managers anticipate problems before they arise. Managers can give rigorous specifications to suppliers to avoid quality Concurrent : gives immediate feedback on how inputs are converted into outputs. Allows managers to correct problems as they arise. Managers can see that a machine is becoming out of alignment and fix it. Feedback : provides after the fact information managers can use in the future. Customer reaction to products are used to take corrective action in the future. 9 — 6 Irwin/Mc. Graw-Hill ©The Mc. 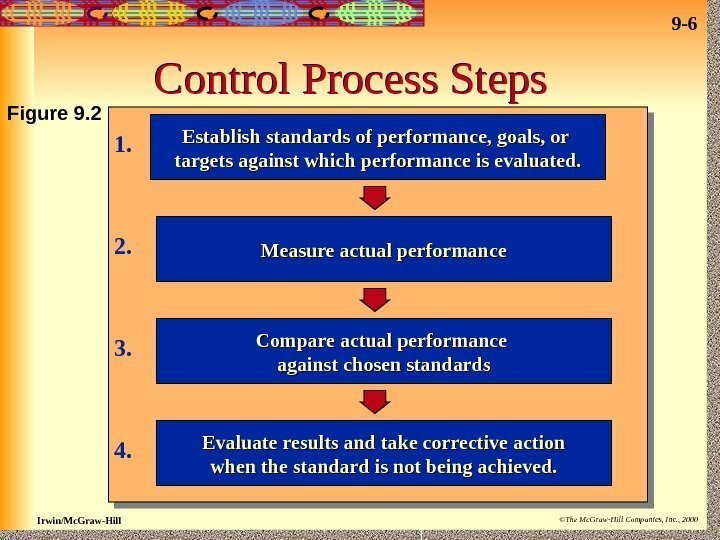 Graw-Hill Companies, Inc. , 2000 Control Process Steps Establish standards of performance, goals, or targets against which performance is evaluated. Measure actual performance Compare actual performance against chosen standards Evaluate results and take corrective action when the standard is not being achieved. 1. 2. 3. 4. Figure 9. 9 — 7 Irwin/Mc. Graw-Hill ©The Mc. 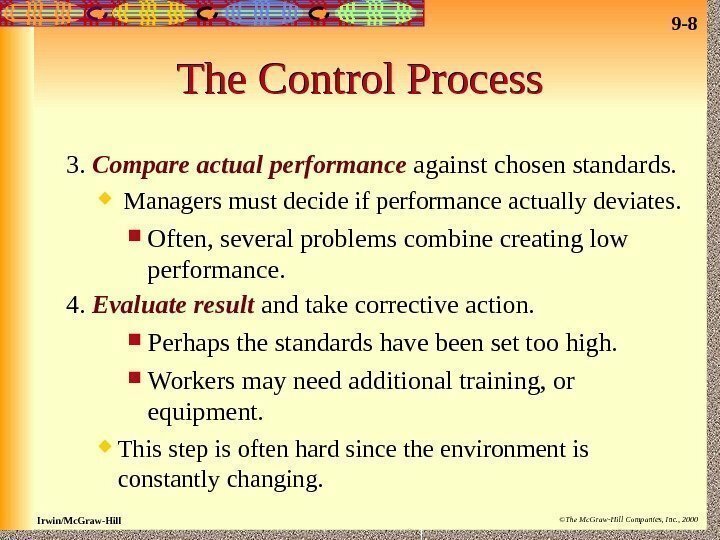 Graw-Hill Companies, Inc. , 2000 The Control Process 1. Establish standards , goals, or targets against which performance is to be evaluated. Standards must be consistent with strategy, for a low cost strategy, standards should focus closely on cost. Managers at each level need to set their own standards. 2. 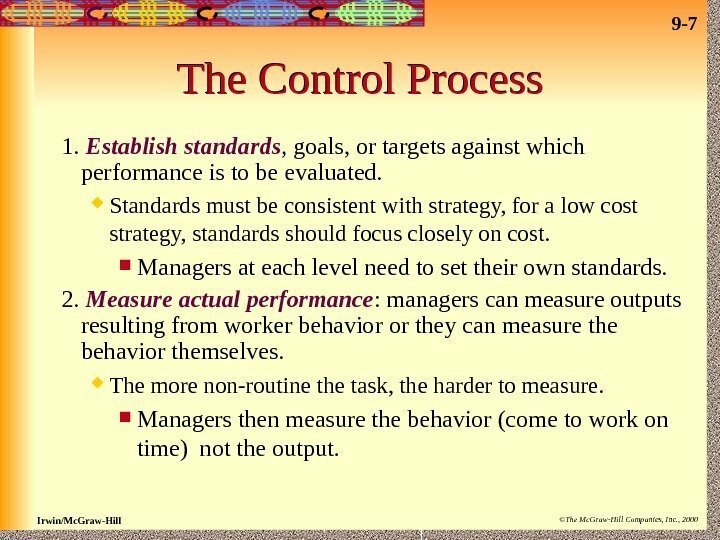 Measure actual performance : managers can measure outputs resulting from worker behavior or they can measure the behavior themselves. The more non-routine the task, the harder to measure. Managers then measure the behavior (come to work on time) not the output. 9 — 8 Irwin/Mc. Graw-Hill ©The Mc. 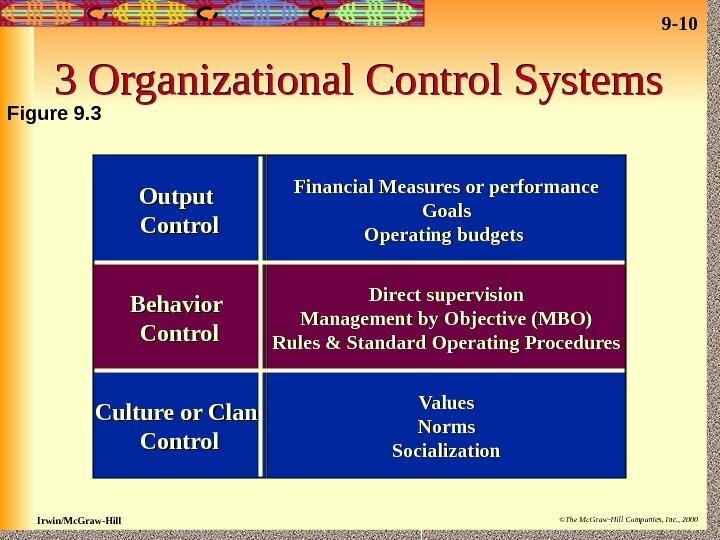 Graw-Hill Companies, Inc. , 2000 The Control Process 3. Compare actual performance against chosen standards. Managers must decide if performance actually deviates. Often, several problems combine creating low performance. 4. Evaluate result and take corrective action. Perhaps the standards have been set too high. Workers may need additional training, or equipment. This step is often hard since the environment is constantly changing. 9 — 9 Irwin/Mc. Graw-Hill ©The Mc. 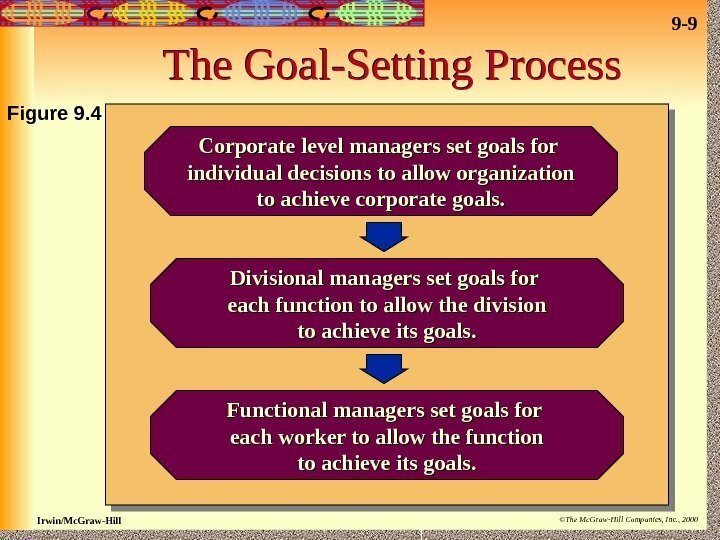 Graw-Hill Companies, Inc. , 2000 The Goal-Setting Process Corporate level managers set goals for individual decisions to allow organization to achieve corporate goals. Divisional managers set goals for each function to allow the division to achieve its goals. Functional managers set goals for each worker to allow the function to achieve its goals. Figure 9. 9 — 10 Irwin/Mc. Graw-Hill ©The Mc. Graw-Hill Companies, Inc. , 20003 Organizational Control Systems Output Control Behavior Control Culture or Clan Control Financial Measures or performance Goals Operating budgets Direct supervision Management by Objective (MBO) Rules & Standard Operating Procedures Values Norms Socialization. Figure 9. 9 — 11 Irwin/Mc. Graw-Hill ©The Mc. Graw-Hill Companies, Inc. , 2000 Output Control Systems Financial Controls are objective and allow comparison to other firms. 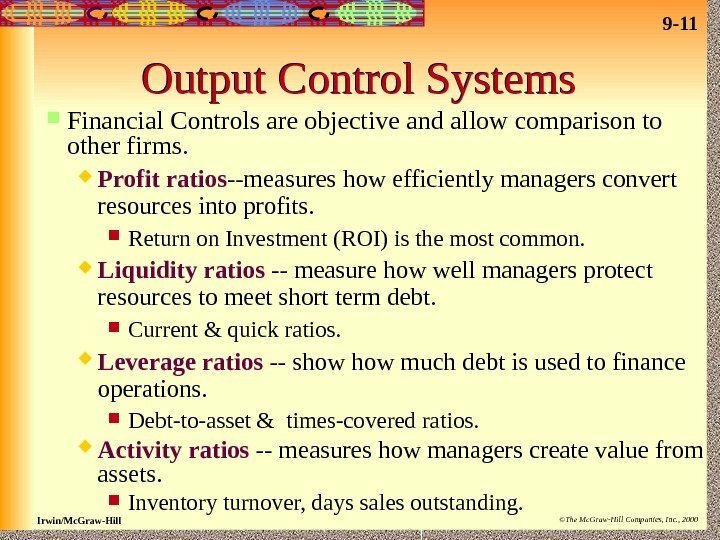 Profit ratios —measures how efficiently managers convert resources into profits. Return on Investment (ROI) is the most common. Liquidity ratios — measure how well managers protect resources to meet short term debt. Current & quick ratios. Leverage ratios — show much debt is used to finance operations. Debt-to-asset & times-covered ratios. Activity ratios — measures how managers create value from assets. Inventory turnover, days sales outstanding. 9 — 12 Irwin/Mc. Graw-Hill ©The Mc. 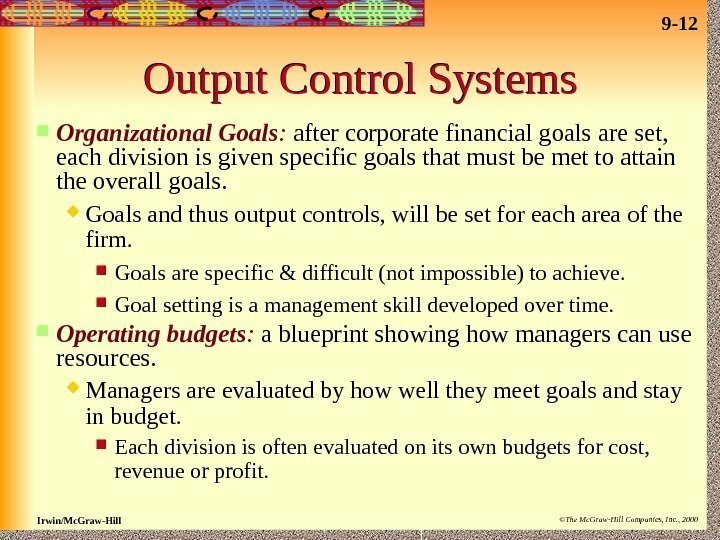 Graw-Hill Companies, Inc. , 2000 Output Control Systems Organizational Goals : after corporate financial goals are set, each division is given specific goals that must be met to attain the overall goals. Goals and thus output controls, will be set for each area of the firm. Goals are specific & difficult (not impossible) to achieve. Goal setting is a management skill developed over time. Operating budgets : a blueprint showing how managers can use resources. Managers are evaluated by how well they meet goals and stay in budget. Each division is often evaluated on its own budgets for cost, revenue or profit. 9 — 13 Irwin/Mc. Graw-Hill ©The Mc. 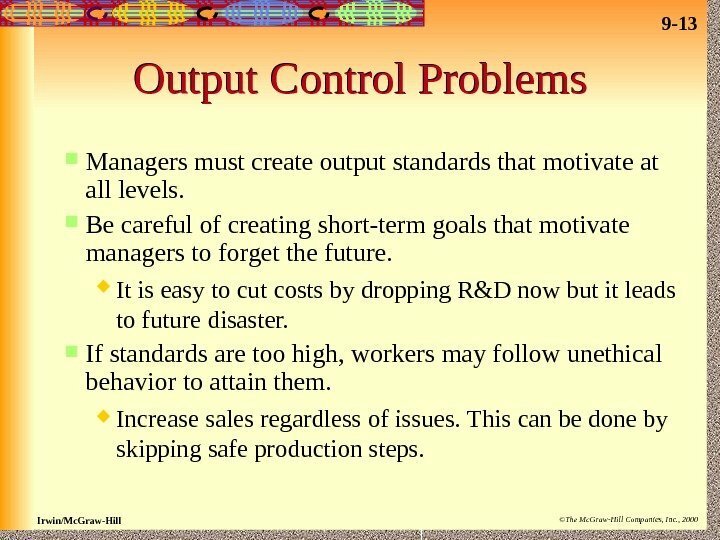 Graw-Hill Companies, Inc. , 2000 Output Control Problems Managers must create output standards that motivate at all levels. Be careful of creating short-term goals that motivate managers to forget the future. It is easy to cut costs by dropping R&D now but it leads to future disaster. If standards are too high, workers may follow unethical behavior to attain them. Increase sales regardless of issues. This can be done by skipping safe production steps. 9 — 14 Irwin/Mc. Graw-Hill ©The Mc. 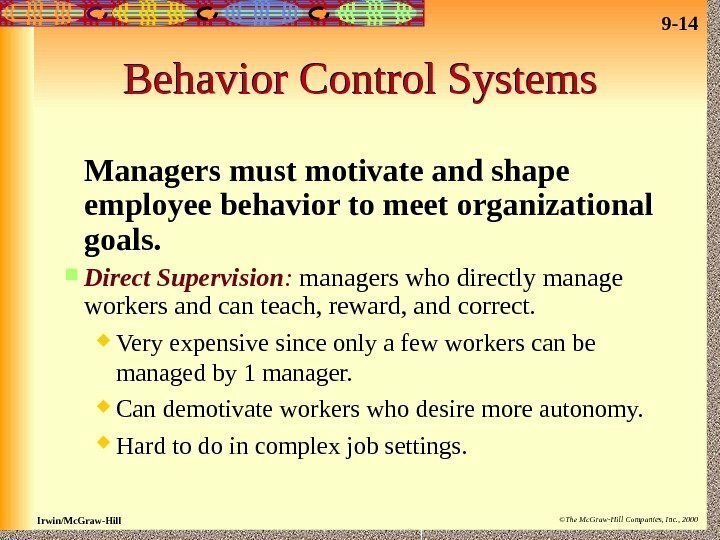 Graw-Hill Companies, Inc. , 2000 Behavior Control Systems Managers must motivate and shape employee behavior to meet organizational goals. Direct Supervision : managers who directly manage workers and can teach, reward, and correct. Very expensive since only a few workers can be managed by 1 manager. Can demotivate workers who desire more autonomy. Hard to do in complex job settings. 9 — 15 Irwin/Mc. Graw-Hill ©The Mc. 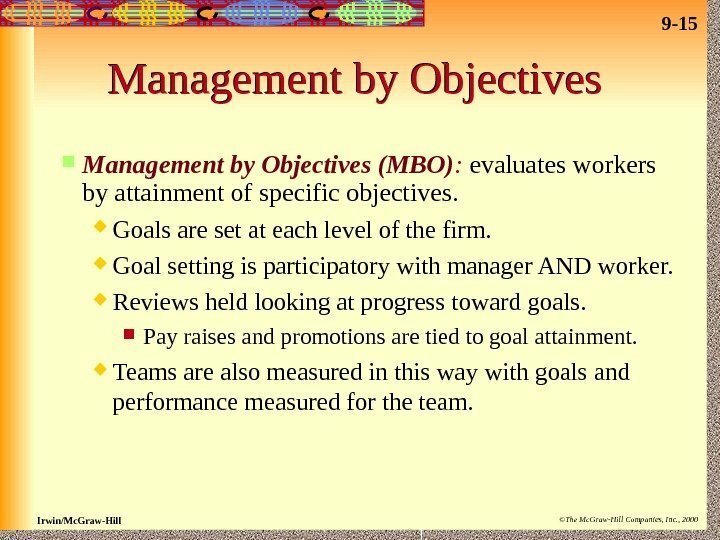 Graw-Hill Companies, Inc. , 2000 Management by Objectives (MBO) : evaluates workers by attainment of specific objectives. Goals are set at each level of the firm. Goal setting is participatory with manager AND worker. Reviews held looking at progress toward goals. Pay raises and promotions are tied to goal attainment. Teams are also measured in this way with goals and performance measured for the team. 9 — 16 Irwin/Mc. Graw-Hill ©The Mc. 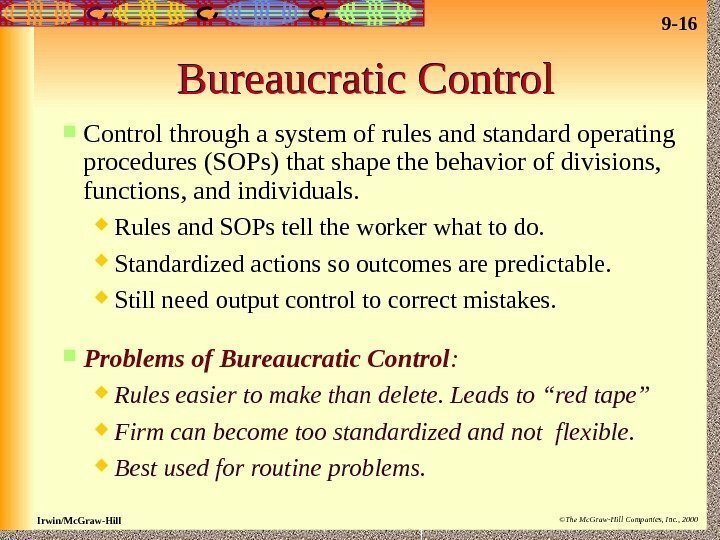 Graw-Hill Companies, Inc. , 2000 Bureaucratic Control through a system of rules and standard operating procedures (SOPs) that shape the behavior of divisions, functions, and individuals. Rules and SOPs tell the worker what to do. Standardized actions so outcomes are predictable. Still need output control to correct mistakes. Problems of Bureaucratic Control : Rules easier to make than delete. Leads to “red tape” Firm can become too standardized and not flexible. Best used for routine problems. 9 — 17 Irwin/Mc. Graw-Hill ©The Mc. 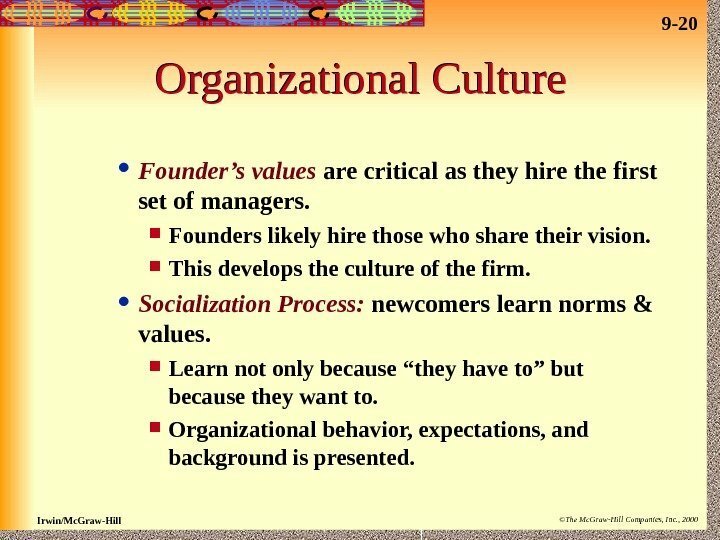 Graw-Hill Companies, Inc. , 2000 Organizational Culture & Clan Control Organizational culture is a collection of values, norms, & behavior shared by workers that control the way workers interact with each other. Clan Control : control through the development of an internal system of values and norms. Both culture and clan control accept the norms and values as their own and then work within them. Examples include dress styles, work hours, pride in work. These methods provide control where output and behavioral control does not work. Strong culture and clan control help worker to focus on the organization and enhance its performance. 9 — 18 Irwin/Mc. Graw-Hill ©The Mc. 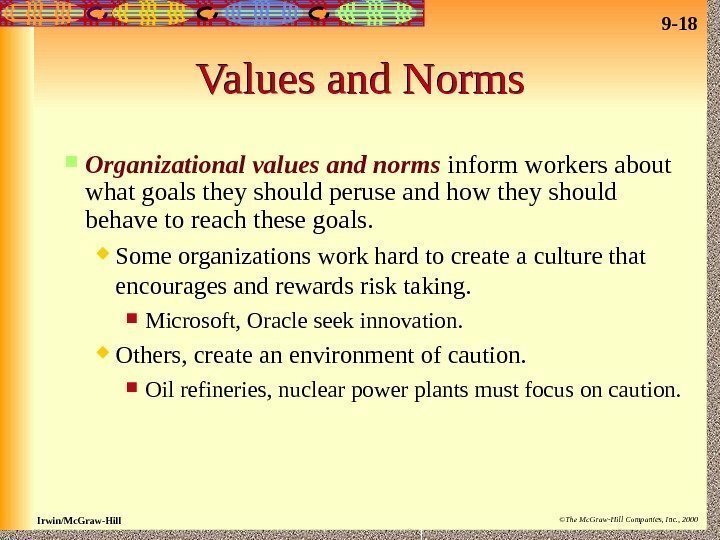 Graw-Hill Companies, Inc. , 2000 Values and Norms Organizational values and norms inform workers about what goals they should peruse and how they should behave to reach these goals. Some organizations work hard to create a culture that encourages and rewards risk taking. Microsoft, Oracle seek innovation. Others, create an environment of caution. Oil refineries, nuclear power plants must focus on caution. 9 — 19 Irwin/Mc. Graw-Hill ©The Mc. Graw-Hill Companies, Inc. , 2000 Creating Strong Organizational Culture Values of Founder Socialization Process Ceremonies & Rites Stories & Language Organizational Culture. Figure 9. 9 — 20 Irwin/Mc. Graw-Hill ©The Mc. Graw-Hill Companies, Inc. , 2000 Organizational Culture Founder’s values are critical as they hire the first set of managers. Founders likely hire those who share their vision. This develops the culture of the firm. Socialization Process: newcomers learn norms & values. Learn not only because “they have to” but because they want to. 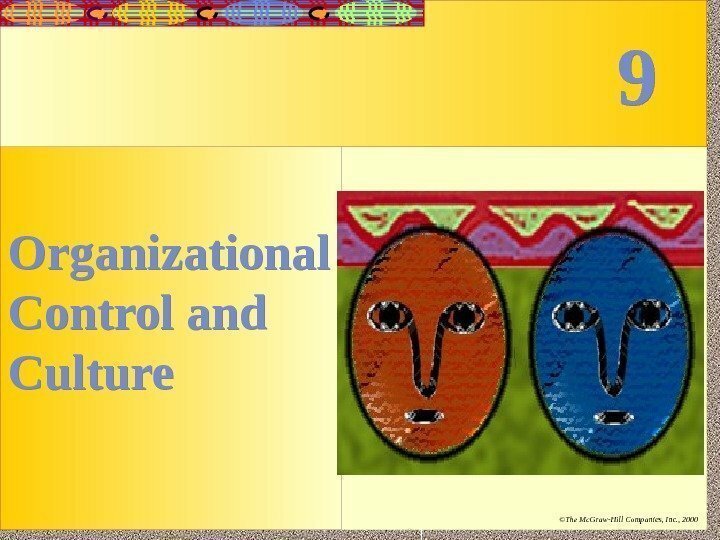 Organizational behavior, expectations, and background is presented. 9 — 21 Irwin/Mc. Graw-Hill ©The Mc. 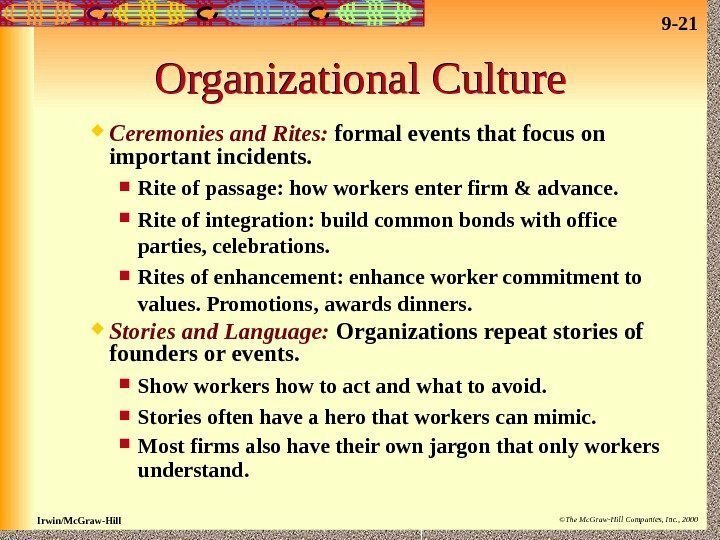 Graw-Hill Companies, Inc. , 2000 Organizational Culture Ceremonies and Rites: formal events that focus on important incidents. Rite of passage: how workers enter firm & advance. Rite of integration: build common bonds with office parties, celebrations. Rites of enhancement: enhance worker commitment to values. Promotions, awards dinners. Stories and Language: Organizations repeat stories of founders or events. Show workers how to act and what to avoid. Stories often have a hero that workers can mimic. Most firms also have their own jargon that only workers understand. 9 — 22 Irwin/Mc. Graw-Hill ©The Mc. 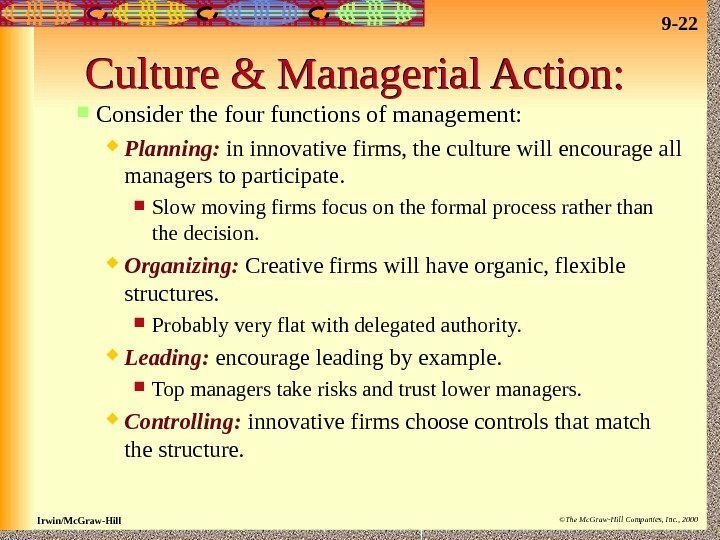 Graw-Hill Companies, Inc. , 2000 Culture & Managerial Action: Consider the four functions of management: Planning: in innovative firms, the culture will encourage all managers to participate. Slow moving firms focus on the formal process rather than the decision. Organizing: Creative firms will have organic, flexible structures. Probably very flat with delegated authority. Leading: encourage leading by example. Top managers take risks and trust lower managers. Controlling: innovative firms choose controls that match the structure.